Learning in Afterschool & Summer blog readers with a background in scouting or a Foursquare account are already familiar with digital badges; they are a small emblem representing a specific skill or achievement, including from everything from sewing and fishing (scouts) to checking in at your local coffee shop every day (Foursquare). Digital badges are flexible. They can be issued for both small and large accomplishments in any kind of setting. 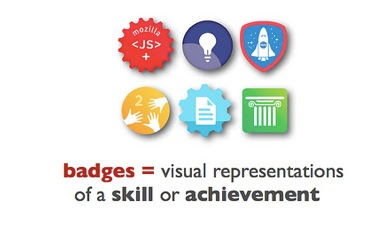 Digital badges create a clear path to mastery. Badges are designed to build on one another, earners complete successively more complex or challenging tasks to earn harder-to-get badges. Digital badges are information rich. Digital badges have “baked in” information about who issued the badge, what the badge holder had to do, and the level of mastery associated with the badge. Digital badges are youth friendly. Badges are ubiquitous in the online gaming community and in social media. Your kids are likely already earning them now. Digital badges are portable. Earners can display their badges on their web page, social media profiles, resumes… anywhere they want to show that they’ve done and learned. I believe that digital badges can do a lot for afterschool and summer programs. Trainers could issue badges to staff members who successfully complete training series or demonstrate on-the-job skills. Youth could earn badges for completing an in-depth project or for working in their community. Program staff could use badges to reward kids’ consistent attendance or contributions to the group. No matter what the specifics, digital badges are a well-defined, public way to name and acknowledge the accomplishments of youth and adults. That’s where the value in badges lies. The Digital Media Learning Badge Competition, sponsored by the MacArthur and Mozilla Foundation, has funded about 20 digital badge projects, most of which are focused on out-of-school time programs. These projects – among others – are funneling into the Open Badges Infrastructure, the emerging hub for hundreds of badge projects around the world.